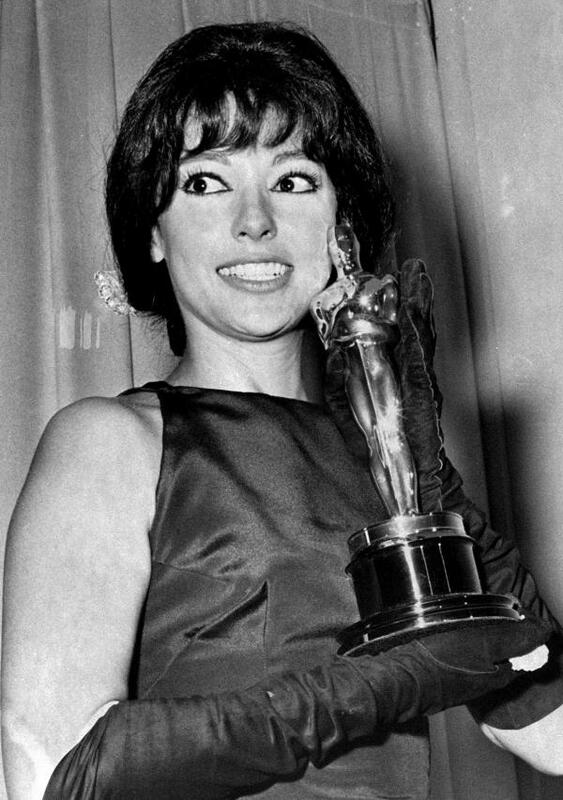 Rita Moreno attends the 90th Annual Academy Awards at Hollywood & Highland Center on March 4 in Hollywood, Calif.
Actress Rita Moreno holds the Oscar she won at the Academy Awards ceremony at Santa Monica, Ca., April 9, 1962. She won best supporting actress of the year for her role in West Side Story. The list of accolades is long for Rita Moreno. The 86-year-old is the only Latina — and one of just 12 artists overall — to have won an Emmy, a Grammy, an Oscar and a Tony for her work. This weekend, she received a different kind of award — for her advocacy. The Ellis Island Honors Society is giving her a medal of honor for her work with immigrant communities. Born Rosa Dolores Alverío Marcano in Puerto Rico, Moreno moved to New York as a child. Throughout her career, she's often been involved in important causes, among them joining Harry Belafonte to take part in the March on Washington for civil rights in 1963. She has been especially proactive in numerous causes for Latinos. Moreno currently stars in the Netflix reboot of the 1970s-1980s TV show One Day at a Time. At a moment where many members of minority communities feel under threat, Moreno talks with NPR's Lulu Garcia-Navarro about the Latino community, her career and her advocacy. You know, I really don't know. I am confused. ... The difference is that we are now really raising our voices like we never have before. And I think that is the big difference, whether we're dealing with someone difficult and dangerous and bizarre as this president. We are getting just as loud as he is, and we are trying to show America that we are not the kind of people that he keeps portraying. And I think that's going to help a great deal. Well, my role hasn't changed at all. I'm still advocating ... I'm going to press for the vote — the Latino vote — when the time comes, because I think it's going to make a great difference. I think we just have to make the people believe that their vote does make a difference. I think people are still under the impression — people of color and minorities --that, "Oh well, you know it's only one vote." It is not one vote. It's hundreds and hundreds of thousands. It was actually heartbreaking: I had won two major awards for West Side Story — I had won the Oscar and a Golden Globe — and fully believing that I was going to get a lot of work from then on and everything was going to be just rosy. And the opposite happened — I couldn't get a job to save my life. There were a few offers, but the offers that were offered were minor movies with gangs. I just couldn't believe it. I'm telling you that it broke my heart at the time — it just absolutely broke my heart. I think what's changed for Latino performers is Latino performers! I think we have spoken out, and the door is much more open now — I don't think it's open enough, but it's certainly more open — and we're pushing the gates, and that's what it takes. I think we can take a really good lesson from the black community. They've finally done it, my God. They've done several movies now that simply show the film business that a movie with black actors in it can actually not only make money but be a huge success. There has been progress. I don't think there has been enough progress, considering the amount of effort that has gone into trying to get that progress going. But yes, the door is open, it's just not wide open. Ricardo Montalban used to say "the door is ajar." What a devastation. My God. It's as though they can't do right for doing wrong. What a curse. It's horrifying. By the way, I just sent, uh — I and someone else just sent about 70 water filters to my hometown and the outlying towns around it. And they're really marvelous because they are hand-cranked, so they don't have to depend only on the sun. But you know, that's a drop in the bucket. That's nothing compared to what is needed. I met with the mayor of San Juan yesterday — what a great gal she is. ... She is determined to turn things around, but she can't do it by herself. You know, we need funds from the [federal government]. It's shocking, absolutely shocking what's happened to this country. It's become a Third World country overnight. I know that the governor didn't want to offend the president for fear that we would lose even more, but frankly I think he could have done a whole lot better when what's-his-name — the president went to Puerto Rico. I get so angry at him I can't remember his damn name! Trump, Trump — el payaso! ... Yeah, the clown! I really think that Rossello could have done better, and I was very, very angry at him for not speaking up — but I guess he was between a rock and a hard place. On what she'd say to her "gente"
What I say to my gente [people] is to hang on, and to remember who they are, be proud of who they are, and keep talking. And keep complaining, and just don't ever — don't give up. That's always been my motto anyway. My motto has always been "persevere" — perseverancia. And that's what we need to do. NPR's Digital News Editor Maquita Peters produced this story for the Web. 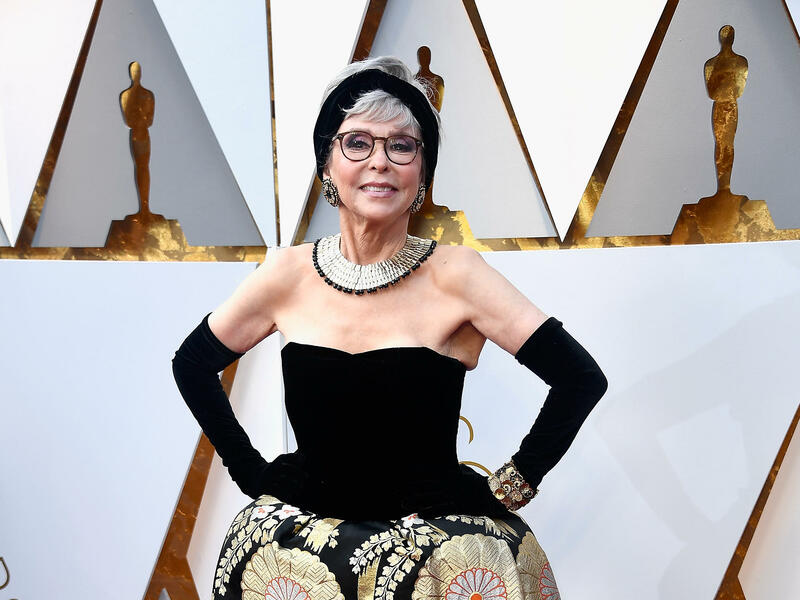 The list of accolades is long for Rita Moreno. She is the only Latina to have won an Emmy, a Grammy, an Oscar and a Tony for her work. And this weekend, she received a different award for her advocacy. The Ellis Island Honor Society is giving her a medal of honor for her work with immigrant communities. She joins us now from the dressing room at "The Wendy Williams Show," which is the noise I think we can hear behind you. And I want to say congratulations. And what a tremendous honor it is for us to have you on the show. RITA MORENO: I'm delighted to be here, Lulu. Thank you so much. GARCIA-NAVARRO: You've always been involved in important causes. You joined Harry Belafonte to take part in the March on Washington for civil rights in 1963. You've been involved in numerous causes for Latinos. This is a moment when many inside minority communities feel under threat. MORENO: As well they should. GARCIA-NAVARRO: Yeah. Where are we now? You've seen so much over so many years. Where are we now in your view? MORENO: You know, I really don't know. I am confused. But I - but here's the difference. We are now really raising our voices like we never have before. And I think that is the big difference, whether we're dealing with someone difficult and dangerous and bizarre as this president. We are getting just as loud as he is. And we are trying to show America that we are not the kind of people that he keeps portraying. And I think that's going to help a great deal. GARCIA-NAVARRO: Where's your role in that - in this conversation? MORENO: Well, my role hasn't changed at all. I'm still advocating. And I'm really pressing for - I'm going to press for the vote, the Latino vote, when the time comes because I think it's going to make a great difference. I think we just have to make the people believe that their vote does make a difference. I think people are still under the impression - people of color and minorities - that, oh, well, you know, it's only one vote. It is not one vote. It's hundreds and hundreds of thousands. GARCIA-NAVARRO: I'd like to just ask you also a little bit about Hollywood. You know, there's a huge discussion about representation. But you were talking about this issue in the 1960s. I read a quote as I was researching this that said, "Hollywood Jim Crowism must end now in all of its aspects," which is amazing if you think about how long it has taken for this issue to really gain traction. Why has it taken so long? MORENO: Well, part of the reason, I think, is that I don't think everybody was as serious about it then as they are now. I think we have found a voice. I think the #MeToo movement has done something quite extraordinary in all kinds of directions, not just about men and sexuality but about just simply being heard and being listened to. I think we were voices in the wind, and the wind was blowing the wrong way. And we weren't experienced yet at how quite to do this. I think we are getting the experience now. And I think that we're going to - it's going to make a big difference. I really believe that. GARCIA-NAVARRO: You, though, took a stand pretty early in your career. You didn't act for several years after winning your Oscar for Anita in "West Side Story" because you refused to take the sort of stereotyped roles that were offered. I think in your memoir, you referred to them as generic ethnics. That must have been tough to do. MORENO: It was actually heartbreaking. I had won two major awards for "West Side Story." I'd won the Oscar and the Golden Globe - and fully believing that I was going to get a lot of work from then on. And the opposite happened. I couldn't get a job to save my life. There were a few offers, but the offers that were offered were minor movies with gangs. I just couldn't believe it. I'm telling you that it broke my heart at the time. It just absolutely broke my heart. GARCIA-NAVARRO: So what's changed for Latino performers, do you think? MORENO: I think what's changed for Latino performers is Latino performers. I think we have spoken out. And the door is much more open now. I don't think it's open enough, but it's certainly more open. GARCIA-NAVARRO: I guess I'm just going to close by asking you something that I want to know because as a Latina, you know, you've been such an inspiration. You know, as someone who's had to fight for recognition at every step, what do you say to you know your gente right now? MORENO: What I say to my gente is to hang on and to remember who they are. Be proud of who they are and keep talking and keep complaining and just don't give up. That's always been my motto anyway. My motto has always been persevere - (speaking Spanish). And that's what we need to do. GARCIA-NAVARRO: That was Rita Moreno, national treasure and icon. She's currently starring in "One Day At A Time" on Netflix. And she just won an award for her advocacy. Thank you so very much. MORENO: It's my pleasure. Thank you for asking the good questions. Transcript provided by NPR, Copyright NPR.